Hollywood Video caused two distinct feelings today. 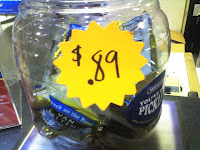 The first is a combination of disgust and intrigue because at there counter they were selling Pickles out of a bucket. Really not something I would ever feel like wanting in a movie rental establishment. Ever. The second was a great flashback to my childhood days. They had trading cards! I bought a bunch of Heroes cards. They were located to the right of the pickles. Next to some Hannah Montana cards. I believe Ms. Montana may be sullying the good name of Heroes in such a close proximity. Just like I sullied the back of my brother's car with Hannah Montana stickers. Man, was he pissed. Who thought they were still selling cards? I mean, come on, how awesome is this? Heroes is a good show, and I thoroughly enjoy the ability to collect cards I will never actually trade. Although, I think it would be better if the cards came with those crappy sticks of gum coated in white powder that used to be in baseball and Garbage Pail Kids cards. The kind of gum that was just small enough to not disintegrate, but not large enough to actually be considered worthwhile. The best part of the gum was that when you first tried to chew it, the gum would actually shatter into little gum shards before becoming a tiny gum blob. Heroes: Eclipse part 1: part 2 ?? ?